Brentwood Karting01277 260001work Go-kartingWe host the South-East's widest and most accessible outdoor go-karting race track, suitable for Adults and Junior Karting enthusiasts of all skill levels. Karts available on this top ranking circuit include the single engine kart with a top speed of 45mph and the speed controllable Cadet kart with a possible top speed of 45mph. Brentwood Karting was established in 1984 and has since undergone two circuit upgrades; the last one, in 2008, a major one, boosting the circuit size from 5m wide and 250m long to a massive 8m wide and 825m long. The circuit is fairly quick and smooth to drive, with only one corner requiring firm braking. 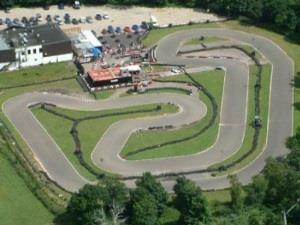 And while the layout means it is perfectly suited to first-timers, it is certainly a challenge to get a good lap time. Not only does it offer numerous racing lines, but also plenty of overtaking opportunities. Designed and built specifically to our circuit, we run a large fleet of the very latest state-of-the-art BIZ karts, serviced and maintained to a meticulous standard. Uniformity is always a priority to us and they are tested and tweaked to within 4/10th of a second. Not only are they quick, but the handling and set up is sharp and precise. With full wraparound bumpers and inbuilt speed restriction units, these really are the pinnacle of excitement and safety. We host the South-East's widest and most accessible outdoor go-karting race track, suitable for Adults and Junior Karting enthusiasts of all skill levels. Karts available on this top ranking circuit include the single engine kart with a top speed of 45mph and the speed controllable Cadet kart with a possible top speed of 45mph.